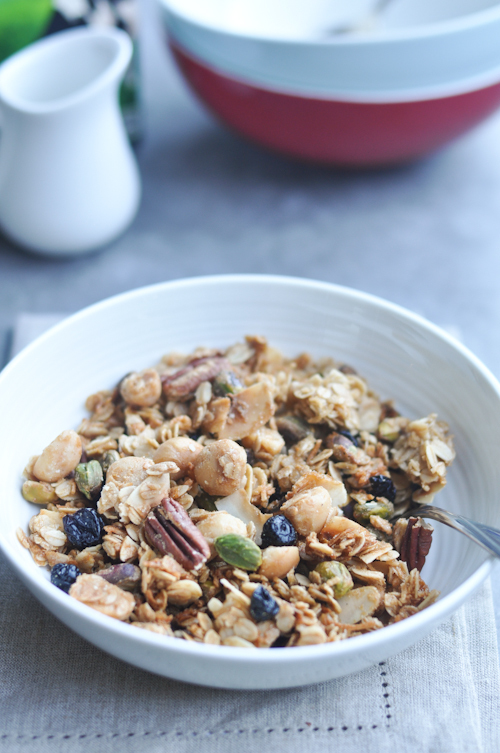 There’s a granola movement happening in our family nowadays – we can’t get enough of it. It started innocently enough. I had been wanting to try the granola recipe from Daniel Humm’s Eleven Madison restaurant ever since I saw an interview where he said that he loved to run every morning and made his own granola. He thought it was a great idea to give a jar of granola to each person who dined at his restaurant. Apparently, his granola is legendary. I think… mine is better. I know it’s a big and bold statement but the beauty of this recipe is that you can adapt it to your taste. The way I look at it, the basic recipe is made up of rolled oats, brown sugar, maple syrup and olive oil – from there you’re free to add whatever else you like. The original recipe calls for pepitas and dried sour cherries. I substituted macadamias and dried blueberries instead. My husband prefers his with almonds and pecans. My sister adds dried mangoes… See? I told you there was a granola movement in the family! Everyone has their own recipe which they claim is the best version. We can’t agree on which version is best. We can’t even agree on when and how to eat it. I like it for breakfast with milk. My sister likes it as a snack with yogurt. Her husband takes his with skim milk and my husband treats it more like a snack. I’m sure as a family which version, when to eat it and what to eat the granola with will be one of those things that we will never come to terms with. But I’d still encourage you to try this recipe (or a version of it) and share it with your families as well. 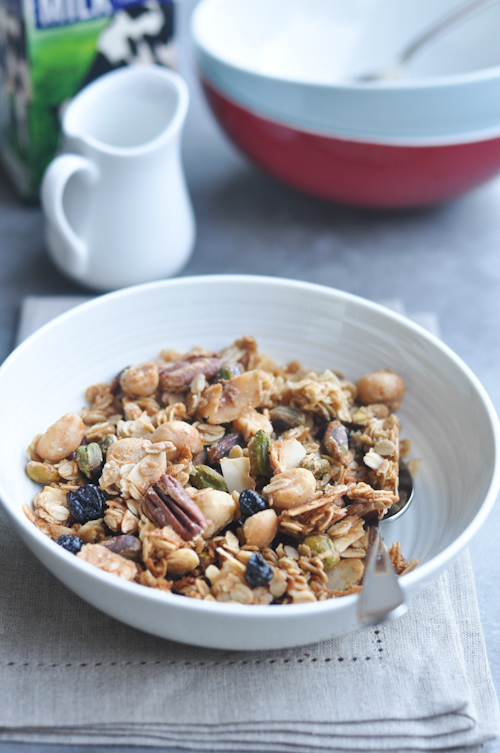 Mix the rolled oats, coconut chips and nuts in a large bowl. In a saucepan, heat the brown sugar, maple syrup and olive oil until the sugar has melted, around 2 to 3 minutes. Remove the brown sugar/maple syrup from the heat and add the salt. Pour this over the rolled oats mixture and mix until well combined. Line a baking sheet with parchment paper and spread the granola over it. Bake in a pre-heated 150c oven for 30 to 40 minutes until golden and the mixture has dried. Stir the granola once or twice while baking. When done baking, add the dried blueberries. Allow to cool and store.